Unbroken is a 2014 American war film produced and directed by Angelina Jolie, written by the Coen brothers, Richard LaGravenese, and William Nicholson, based on the 2010 non-fiction book by Laura Hillenbrand, Unbroken: A World War II Story of Survival, Resilience, and Redemption. The film stars Jack O'Connell as USA Olympian and army officer Louis "Louie" Zamperini, who survived in a raft for 47 days after his bomber crash-landed in the ocean during the Second World War, then was sent to a series of prisoner of war camps. The film had its world premiere in Sydney on November 17, 2014, followed by a London premiere at the Odeon Leicester Square on November 26, 2014. The film was released in the United States on December 25, 2014. It received mixed reviews from critics but was a moderate financial success, grossing $163 million worldwide. The film was followed by a sequel, Unbroken: Path to Redemption, in 2018. During an April 1943 bombing mission against the Japanese-held island of Nauru, Louis "Louie" Zamperini is flying as a bombardier of a United States Army Air Forces B-24 Liberator bomber when his plane is damaged in combat, with a number of the crew injured. The pilot, Phil, brings it to a stop at the end of the runway suffering from an exploded tire. As a young Italian-American boy in Torrance, Louie misbehaves by stealing, drinking liquor and smoking. He is often picked on by others due to his Italian ethnicity. His brother Peter sees how fast Louie can run and decides to train him to be a runner. Louie becomes disciplined and becomes a distance runner, earning the nickname "The Torrance Tornado". Louie comes in 8th in the 1936 Summer Olympics and sets a record in the final lap for the 5,000-meter race. Returning to 1943, Louie, the surviving crew and several replacements are sent on a search-and-rescue mission with a plane previously used for spare parts. One left engine fails, while the crew bungles the remaining engine, and they crash in the ocean. Louie, Mac, and Phil survive, living on two inflatable rafts. On the 27th day they attract the attention of a Japanese plane, which strafes and damages the rafts but misses them. Mac dies 6 days later. On the 47th day, Japanese sailors capture Louie and Phil. Now, prisoners of war, Louie and Phil are put in a Kwajalein Atoll dungeon. The Japanese ask Louie and Phil for information about newer bombers and the Norden bombsight. Louie states they flew older models and draws a rendition of a Philco radio. They are dragged out to disrobe and kneel on planks. Instead of being executed, they are crudely washed and shipped to Japan. Upon arrival, the two are separated and sent to different POW camps. Louie's camp, Ōmori, in Tokyo, is headed by Japanese corporal Mutsuhiro Watanabe who is especially tough on Louie, beating him often. Louie is given an opportunity to broadcast a message home saying he is alive after learning the US government classified him as KIA. When refusing to broadcast another message laden with anti-American propaganda, he is sent back to camp where Watanabe has each prisoner punch him. After two years, Watanabe is promoted and leaves the camp. The camp is damaged when Tokyo is bombed, so Louie and the others are forced to move to Naoetsu prison camp, where Louie discovers that Watanabe is in command and the prisoners are put to work loading coal barges. Louie pauses during work, so Watanabe makes him lift a large beam, ordering a guard to shoot Louie if he drops it. Louie successfully lifts and holds it up, despite exhaustion. This enrages Watanabe as Louie stares him straight in the eye, provoking him to beat Louie severely. At the end of the war, Louie and the other prisoners in the camp are liberated when the Americans occupy Japan. Louie tried to find Watanabe in his quarters but realizes he had fled. Louie sits down and stares at a picture of Watanabe as a child standing with his father. He is returned home to America, Louie kisses the ground just as he arrives home to his family. At the end of the film, there is a slideshow that shows what happened after the war. The real Louis married and had two children. Phil too survived, also marrying. Mutsuhiro "The Bird" Watanabe went into hiding and evaded prosecution despite being in the top 40 most-wanted Japanese war criminals list by General Douglas MacArthur. Louie lived out his promise to convert to Christianity, devote his life to God and forgive his war-time captors, meeting with many of them. Watanabe, however, refused to meet with Louie. Louie had an opportunity to relive his time as an Olympian when he ran a leg of the Olympic Torch relay for the 1998 Winter Olympics in Nagano, Japan. He was four days short of his 81st birthday. The stretch he ran was not far from one of the POW camps where he was held. The closing titles reveal Louie Zamperini died on July 2, 2014, at age 97. Universal Pictures purchased the rights to the book in January 2011, having already acquired the film rights to Zamperini's life story towards the end of the 1950s. Early drafts for the film were written by William Nicholson and Richard LaGravenese while Francis Lawrence was scheduled to direct. Joel and Ethan Coen were then tapped to rewrite the script after Jolie was named director. On September 30, 2013, Jolie was confirmed to direct the film in Australia. Jolie was paid a $1 million salary for directing the film. Walden Media was originally set as Universal's co-financier, but withdrew from the project prior to filming and were subsequently replaced by Legendary Pictures. The filming was based in New South Wales and Queensland, with scenes also shot in Fox Studios Australia and Village Roadshow Studios. Principal photography began on October 16, 2013, in Queensland, Australia and ended on February 4, 2014, with post-production also being done in Australia. Some of the scenes were shot at sea in Moreton Bay on October 16, 2013. On December 14, four days of filming were completed in Werris Creek, New South Wales. Other scenes were shot at Cockatoo Island (New South Wales). The official film soundtrack was released on December 15, 2014, through Parlophone and Atlantic Records. The film score was composed by Alexandre Desplat. The album also features "Miracles", a song written and recorded by British alternative rock band Coldplay, which was released digitally as a single on December 15. Unbroken grossed $115.6 million in the U.S. and Canada and $47.6 million in other territories for a worldwide total of $163 million, against a budget of $65 million. The film opened in North America on December 25, 2014, across 3,131 theaters and grossed $15.6 million on its opening day (including Christmas Eve previews) which is the third-biggest Christmas Day debut ever, behind Les Misérables ($18 million), and Sherlock Holmes ($24 million) and the fifth-biggest Christmas Day gross ever. The film was among one of the four widely released films on December 25, 2014, the other three being Walt Disney's Into the Woods (2,478 theaters), Paramount Pictures' The Gambler (2,478 theaters) and TWC's Big Eyes (1,307 theaters). It earned $31,748,000 in its traditional three-day opening weekend (including its revenue from Christmas Day it earned $47.3 million) debuting at #2 at the box office behind The Hobbit: The Battle of the Five Armies setting a record for the third-biggest Christmas debut behind Sherlock Holmes ($62 million) and Marley & Me ($36 million). and fourth biggest among World War II theme movies. It was the eighth film that earned $25 million plus in its debut weekend for Universal Pictures and the fifth $30 million plus debut for an "original" movie following Lone Survivor, Ride Along, Neighbors and Lucy. The film received mixed reviews from critics. Rotten Tomatoes gives the film a rating of 50% based on 220 reviews, with an average rating of 6/10. The website's critical consensus reads, "Unbroken is undoubtedly well-intentioned, but it hits a few too many of the expected prestige-pic beats to register as strongly as it should." On Metacritic, the film has a score of 59 out of 100 based on 48 reviews, indicating "mixed or average reviews". Audiences surveyed by CinemaScore gave the film an average grade of "A-" on an A+ to F scale. The audience was 52 percent female and 71 percent over the age of 25. The SAG Nominating Committee gave it a standing ovation after a screening. The score received a mixed critical reaction. Callum Hofler of Entertainment Junkie stated, "At its finest, Unbroken is perhaps Desplat's strongest and most resonant emotional work since The Tree of Life or Harry Potter and the Deathly Hallows – Part 2, both from 2011. It comes off as bold, ambitious, yet intimate and sentimental all the same. It can be an elegant and harmonious exploration of human determination, drive and spirit." He also criticized numerous components, claiming that, "In most cases though, the primary issue with the album is its lack of energy and vitality. There is many a time where the music seems to just sit in place, lacking major progression in character, motive or mindset." He awarded the score a final rating of 6 out of 10. Jorn Tillnes of Soundtrack Geek acclaimed the album, stating, "This score is pretty great. It's been a really good year for Desplat. Godzilla and The Monuments Men at the top of the pile, but this is not far behind." He summarized with, "It is a turning point though for those who think Desplat is about boring bass rhythms and motifs. This might even get the haters to respect him as a composer." He awarded the score an 87.8 out of 100. Prior to the film's release, some Japanese nationalists asked for the film and the director to be banned from their country, largely because of a part in Hillenbrand's book, which was not depicted in the film, where she writes "POWs were beaten, burned, stabbed, or clubbed to death, shot, beheaded, killed during medical experiments, or eaten alive in ritual acts of cannibalism" by the Imperial Japanese Army. A petition on Change.org calling for a ban attracted more than 10,000 signatures. In response, it triggered a Change.org petition by Dutch Indonesian group The Indo Project voicing support for the movie, as they saw it as a reflection of what their family members in the former Dutch East Indies experienced in Japanese camps. Several prominent Dutch Indos (including those who are not descendants of former POWs), such as author Adriaan van Dis, Doe Maar frontman Ernst Jansz, and actress Wieteke van Dort, signed the petition in support of the film. Another petition on Change.org calling for a release of the film in Japan, this time in Japanese, gathered more than 1,200 signatures. The film was eventually released in Japan on February 6, 2016, by independent distributor Bitters End on a much smaller scale than originally intended, while Toho-Towa, the usual distributor of Universal titles, had passed on releasing the film. The film received some criticism for omitting Zamperini's fight against alcoholism and PTSD, as well as his Billy Graham-inspired religious conversion. Unbroken was released on March 24, 2015 in the United States in two formats: a one-disc standard DVD and a Blu-ray Combo pack (Blu-ray + DVD + Digital Copy). A faith-based film also based on Hillenbrand's book, titled Unbroken: Path to Redemption, which depicts later events of Zamperini's life than those depicted in Unbroken, was released by Pure Flix Entertainment on September 14, 2018. It was directed by Harold Cronk with the script written by Richard Friedenberg and Ken Hixon. Aside from producer Matthew Baer, none of the original cast or crew was involved in the new film. The Great Raid, a 2005 war film about the raid at Cabanatuan in the Philippines during World War II. To End All Wars, a movie set in a Japanese prisoner of war labour camp where the inmates are building the Burma Railway during World War II. Merry Christmas, Mr. Lawrence, a 1983 Japanese war film based on the story of a Japanese POW camp during WWII. My Way, a 2011 South Korean war film based on the story of a Korean captured by the Americans on D-Day. ^ "Unbroken (15)". British Board of Film Classification. November 27, 2014. Retrieved December 1, 2014. ^ a b Horn, John (April 18, 2014). "Angelina Jolie breaks the curse of 'Unbroken'". Los Angeles Times. Retrieved June 9, 2014. ^ "Unbroken (2014)". Box Office Mojo. IMDb. Retrieved March 12, 2016. ^ Alvarez, Joe (November 26, 2014). "Angelina Jolie Dazzled at The London Premiere of Unbroken". IKON London Magazine. Retrieved March 8, 2018. ^ Staff reports (June 9, 2014). "What you need to know about Louis Zamperini movie 'Unbroken' directed by Angelina Jolie". Pasadena Star-News. Retrieved June 11, 2014. ^ Kit, Borys (February 23, 2013). "Coen Brothers to Rewrite Angelina Jolie's 'Unbroken' (Exclusive)". The Hollywood Reporter. Retrieved June 9, 2014. ^ Frater, Patrick (September 30, 2013). "Angelina Jolie's 'Unbroken' Set to Shoot in Oz". Variety. Penske Media Corporation. Retrieved October 3, 2013. ^ Fleming, Mike, Jr (June 2, 2011). "Walden Media Set To Co-Finance Louis Zamperini Film 'Unbroken'". Deadline Hollywood. Retrieved April 7, 2014. ^ "Unbroken" (PDF). Universal Studios. Archived from the original (PDF) on October 9, 2016. Retrieved February 7, 2016. ^ Bulbeck, Pip (September 30, 2013). "Angelina Jolie Confirmed to Direct 'Unbroken' in Australia". The Hollywood Reporter. Retrieved October 3, 2013. ^ "Unbroken Synopsis". OnlineCinemaTickets.com. Retrieved December 22, 2014. ^ Clifford, Catherine (December 14, 2013). "Hollywood actor Angelina Jolie starts filming scenes for the movie 'Unbroken' in Werris Creek". ABC News. Retrieved December 15, 2013. ^ Daily Mail reporter (December 3, 2013). "She's a natural Ange-leader! Hands on approach is the only way for Angelina Jolie as she directs Unbroken in the Australian heat". Daily Mail. Retrieved March 29, 2019. ^ "Alexandre Desplat: Unbroken (Original Motion Picture Soundtrack)". Amazon.com. Retrieved December 13, 2014. ^ "New song Miracles unveiled". Coldplay.com. December 11, 2014. Retrieved December 12, 2014. ^ "'Unbroken' Soundtrack Details". filmmusicreporter.com. November 29, 2014. Retrieved December 15, 2014. ^ Mendelson, Scott (December 26, 2014). "Christmas Box Office: 'Unbroken,' 'Into The Woods' Score Above, 'Selma,' 'American Sniper' Score Below". Forbes. Retrieved December 27, 2014. ^ D'Alessandro, Anthony; Brooks, Brian (December 26, 2014). "'Unbroken' Leads But 'Into The Woods' Back In Race – Christmas B.O. Update". Deadline Hollywood. Retrieved December 27, 2014. ^ Mendelson, Scott (December 27, 2014). "Friday Box Office: Jolie's 'Unbroken' Tops 'Into The Woods,' 'The Interview' Drops Hard". Forbes. Retrieved December 28, 2014. ^ Mendelson, Scott (December 28, 2014). "Box Office: 'Unbroken' Nabs $47M, 'Into The Woods' Conjures $46M Over Christmas Weekend". Forbes. Retrieved December 29, 2014. ^ a b c Subers, Ray (December 28, 2014). "Weekend Report: 'Hobbit,' 'Unbroken,' 'Into the Woods' Score on Final Weekend of 2014". Box Office Mojo. IMDb. Retrieved December 29, 2014. ^ "Unbroken (2014)". Rotten Tomatoes. Fandango Media. Retrieved September 4, 2018. ^ "Unbroken Reviews". Metacritic. CBS Interactive. Retrieved December 30, 2014. ^ "Oscar Contender 'Unbroken' Unveiled to Audiences at Last". Variety. Penske Business Media. Retrieved February 22, 2015. ^ Hofler, Callum (November 22, 2014). "'Unbroken' Score Review". Entertainment Junkie. Retrieved December 22, 2014. ^ Jorn, Tillnes (December 15, 2014). "Soundtrack Review: Unbroken". Soundtrack Geek. Retrieved December 22, 2014. ^ Ryall, Julian (December 8, 2014). "Japan's nationalists attack Angelina Jolie war film". The Telegraph. Retrieved February 6, 2016. ^ Hillenbrand, Laura (2010). Unbroken: A World War II Story of Survival, Resilience, and Redemption. Random House. p. 315. ISBN 978-1-4000-6416-8. ^ a b Ishikawa, Tomoya (March 17, 2015). "Jolie movie 'Unbroken' struggling to find distributor amid heavy criticism". Asahi Shimbun. Retrieved February 6, 2016. ^ "BN'ers tekenen petitie film Unbroken van Angelina Jolie". de Volkskrant (in Dutch). January 5, 2015. Retrieved January 5, 2015. ^ Schilling, Mark (October 21, 2015). "Angelina Jolie's 'Unbroken' Finally Set For Release in Japan". Variety. Penske Media Corporation. Retrieved February 6, 2016. ^ Clayson, Amber (December 18, 2014). 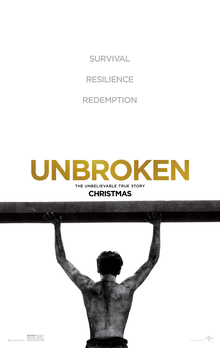 "'Unbroken' faith: The religious journey of Louis Zamperini". Deseret News. Retrieved September 20, 2018. ^ Pulliam Bailey, Sarah (December 18, 2014). "Will 'Unbroken' disappoint Christians?". Charlotte Observer. Retrieved September 20, 2018. ^ Hipes, Patrick (January 15, 2015). "Oscar Nominations: 'Grand Budapest Hotel' & 'Birdman' Lead Way With 9 Noms; 'Imitation Game' Scores 8". Deadline Hollywood. Retrieved January 15, 2015. ^ "'Birdman,' 'Boyhood' 'Unbroken' among AFI's top 2014 films". Reuters. December 8, 2014. Retrieved December 8, 2014. ^ The Deadline Team (January 5, 2015). "'Birdman', 'Foxcatcher' Among Art Directors Guild Nominees". Deadline Hollywood. Retrieved January 5, 2015. ^ Hipes, Patrick (January 7, 2015). "ASC Awards Nominees: 'Birdman', 'Unbroken', 'Mr Turner' On Cinematographers List". Deadline Hollywood. Retrieved January 7, 2015. ^ Lattanzio, Ryan (January 13, 2015). "Cinema Audio Society Nominates 'American Sniper,' 'True Detective' and More". IndieWire. Archived from the original on January 30, 2015. Retrieved January 13, 2015. ^ Gray, Tim (December 15, 2014). "'Birdman,' 'Grand Budapest' Top Critics Choice Awards Nominations". Variety. Penske Media Corporation. Retrieved December 15, 2014. ^ "2018 Rakuten TV Empire Awards". Empire. March 18, 2018. Retrieved March 29, 2019. ^ "Winners". hollywoodawards.com. December 8, 2014. Archived from the original on December 20, 2014. Retrieved December 8, 2014. ^ Giardina, Carolyn (January 8, 2015). "'Guardians of the Galaxy', 'Into the Woods', Lead Make-up Artists and Hair Stylists Guild Nominations". The Hollywood Reporter. Retrieved January 8, 2015. ^ Yamato, Jen (January 14, 2015). "'Birdman,' 'Apes' Top 2015 Golden Reel Nominations". Deadline Hollywood. Retrieved January 14, 2015. ^ "National Board of Review Announces 2014 Winners". Nationalboardofreview.org. December 2, 2014. Retrieved December 2, 2014. ^ Kelley, Seth (March 4, 2015). "'Captain America: The Winter Soldier' and 'Interstellar' Lead Saturn Awards Noms". Variety. Penske Media Corporation. Retrieved March 29, 2019. ^ "'Birdman,' 'Grand Budapest' lead St. Louis film critics nominations". Hitfix. December 11, 2014. Retrieved December 15, 2014. ^ The Deadline Team (January 13, 2015). "Visual Effects Society Awards Nominations Announced". Deadline Hollywood. Retrieved January 13, 2015. ^ "Unbroken – Blu-Ray". UnbrokenFilm.com. Archived from the original on March 31, 2015. Retrieved March 31, 2015. ^ Vasquez, Zach (August 24, 2018). "No rights allowed: the strange world of unofficial movie sequels". The Guardian. Retrieved September 14, 2018.